As winter gives way to Spring in Lancaster County, some people look forward to longer days, others envision flowers in bloom… I can’t wait to tromp through muddy fields in search of great shopping finds at one of Lancaster County’s many annual Mud Sales. Each year, local fire companies host “Mud Sales” as community fundraisers. The sales are set in local fields, which are often muddy from melting snow or rain… thus the name… no acutal MUD is for sale. 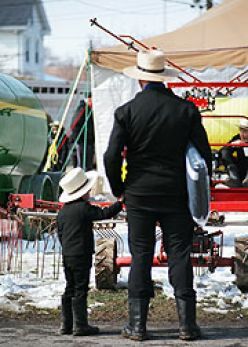 The late Winter and early Spring dates work out best for local farmers because they have more time available before the Spring planting. 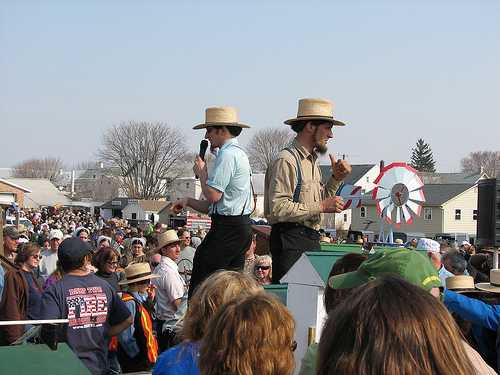 Often auctions are held both inside and outside simultaneously. Sometimes numerous auctions take place at the same time throughout the grounds. So, if you’re not into tromping through fields, there are still options for you! The items sold vary from auction to auction and include a wide variety of donated goods and consignment merchandise. Auctioned items often include furniture, craft items, quilts, building materials, livestock, buggies and carriages, tools, farming supplies and equipment, garden items, and much more. Plus, lots of good food. So make plans to come stay at the Historic Smithton and take in some true Pennyslvania Dutch culture during this year’s Mud Sales. You’ll have a blast & will hopefully go home with a new treasure (or two or three!). 8:30 a.m., Bart Twp. Fire Company, 11 Furnace Rd., Quarryville. 717-786-3348 or Bart Twp. Fire Co. website Antiques, quilts, furniture, new & used equipment, small goods, hay & straw, livestock, buggies, tools, crafts and food.